Feminist Bookstore Slams 'Portlandia' And Says Show Can No Longer Film There : The Two-Way The staff of In Other Words says the TV comedy is "diametrically opposed to our politics and the vision of society we're organizing to realize." 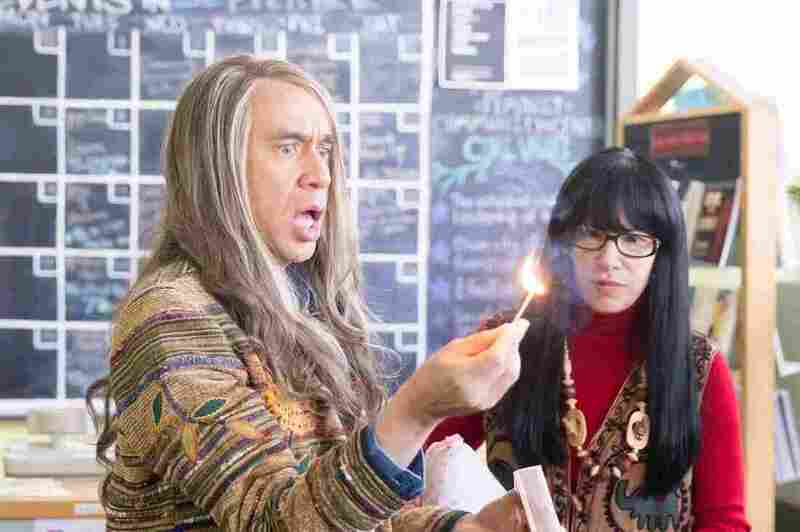 Fred Armisen performs as Candace and Carrie Brownstein as Toni in a Portlandia sketch about two feminist bookstore owners in Portland. In the TV comedy version of Portland, Ore., the bookstore is called Women and Women First. In real life, it's In Other Words — and the shop is using frank terms to say the Portlandia show is no longer welcome to film there. The feminist store and community center faults the show's depiction of men dressing as women, its treatment of store staff, and its role in gentrification and race relations. The staff of In Other Words made those claims in a blog post that shares its title with a sign that was placed in its window when the store's relationship with the show soured. The title is straightforward: "F*** Portlandia" (asterisks ours). The store's staff says that by featuring Portlandia co-star Fred Armisen in a wig and a dress as Candace, one of the owners of Women and Women First, the show "throws trans femmes under the bus by holding up their gender presentation for mockery and ridicule." On TV, the bookstore is portrayed as a home for strident advocacy and outrage. In its blog post, the staff of In Other Words depicts the IFC comedy as "diametrically opposed to our politics and the vision of society we're organizing to realize." We've asked the folks at IFC for their reaction and will update this post when they respond. The tone of the store's blog post is markedly different from 2012, when the comedian and Portlandia regular Kumail Nanjiani visited In Other Words and spoke to some of its board members for a short online video. Asked whether they'd seen the feminist bookstore sketch, one board member (who wasn't identified by name in the video) said, "It's not like a lot of what happens here ... but it's funny." When Nanjiani asked about Armisen dressing as a woman for the sketches, a board member replied, "That's called gender expression." In Other Words is a volunteer-run community center, according to its Facebook page. The store says that none of its current board and staff members were involved in the original decision to allow Portlandia to film inside the store six years ago, and that the "small flat fee per episode filmed" doesn't cover its lost profits. "The additional exposure we have received from our time on Portlandia does not provide financial or political support of any kind: tourists and fans of the show come to our door to stand outside, take selfies, and then leave. The vast majority of them don't come inside." The store also says it has undergone changes in the past two years, saying that it now hosts meetings of Portland's Black Lives Matter group and that "the last time the show filmed in our space, the production crew asked to us to remove the Black Lives Matter sign on our window. We refused." In another passage, the store's staff accuses Portlandia of essentially rolling out a red carpet of twee and whimsy "for the incoming technocrat hordes." The bookstore says it first displayed the "F*** Portlandia" sign several months ago, when its board and staff initially decided to cut ties with the show. The store's blog post seems to have been prompted by local alternative weekly Willamette Week's attempts to ask questions about the sign. On the paper's story about that interaction (which didn't go well), a reader commented, "How can you be sure this isn't just part of another episode of Portlandia?" In Other Words is located in a northeast Portland district called Albina — an area that has a rich history as a home for the city's black residents. Responding to the store's accusation that Portlandia contributes to gentrification and depicts an overly white Portland, at least two readers took the store to task. "Are you serious? Your store itself is the epitome of gentrification to the actual displaced residents of NE Portland," a reader named Xavier Woods wrote in a comment on the store's blog post. "This is 150% valid," the store wrote in response. "Sorry doesn't mean a thing when people are still actively being displaced but we are sorry and we are working every day to make sure we are a contribution to the neighborhood and that we are doing everything we can to build the power of the neighborhood." The store concluded its blog post by asking any readers that support its stance to donate or volunteer.